“We, the citizens of Singapore…” is the pledge that is recited every morning in school. It was written by Rajaratnam, who became the MP for Kampong Glam and Minister for Culture after the 1959 elections. Rajaratnam believed in a democratic society where all races would enjoy equal opportunity. He wrote the Pledge in 1966. Besides the Pledge, his name is remembered in the S Rajaratnam School of International Studies (RSIS) in the Nanyang Technological University. 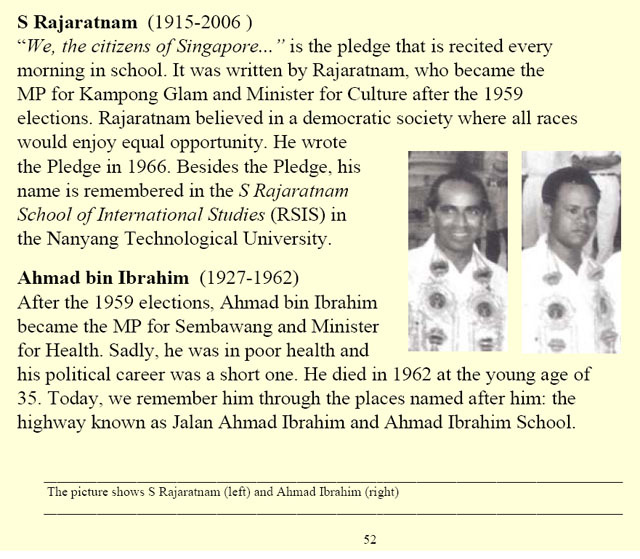 After the 1959 elections, Ahmad bin Ibrahim became the MP for Sembawang and Minister for Health. Sadly, he was in poor health and his political career was a short one. He died in 1962 at the young age of 35. Today, we remember him through the places named after him: the highway known as Jalan Ahmad Ibrahim and Ahmad Ibrahim School.